Since it is clear that the author knows how to meditate properly, I would highly recommend this book to parents that are serious about teaching their young children to meditate. I would suggest this book to parents and children ages 4-7. I found my horrible week just melted away after reading the first few paragraphs, so I am confident it could be helpful to an overly stressed parent of young children as it can be used as a nightly meditation or a calming book for story time. I cannot say enough good things about this book! Lolli and the Thank You Tree features a group of three stories for children that will grab the young reader from the first page with a fun, authentic narrator. From there, the reader is swept away into an imaginative world with thank you trees, colored balls, travels inside of bubbles, Buddha plants, magic dust, and Mysterious Munchies. Lolli is a positive narrator, and one that should inspire children through her colorful adventures. At the heart of the book is a lesson on meditation for children, all of them guided through these imaginative worlds. The book is quite unique, with an emphasis on wishes, choices, and keeping away negativity and focusing on all the good in life. This is an interactive book that parents should read to their children. The illustrations in Lolli and the Thank You Tree were fun and appropriate while not overpowering the story. With a focus on imagination, the illustrations were just right -- not too much was taken away from the child's own thought process. In addition, the book entices children to think on their own and answer questions. Heaven and angels are portrayed in a positive, non-threatening way, making the child reader feel safe through these meditative journeys. Themes of love, kindness, happiness, and positivity are explored, all with a gentle, identifiable narrator that author Elena Paige constructs with authenticity and ease. I highly recommend this book to parents who want to explore the world of meditation and imagination with their children. It should bring plenty of smiles! Lolli and the Thank You Tree, Meditation Adventures for Kids, Book 2 is a collection of three guided meditations for children, and their parents or caregivers, written by Elena Paige. Lolli's adventures are designed to be read to children as they are relaxing with their eyes closed, but they can also be shared during story time hour to allow kids to enjoy the panels accompanying the text. The illustrations in Paige's Meditation Adventures are also available for coloring through her Super Happy Kids Club. In Lolli and the Thank You Tree, Lolli takes her friends to a rain forest. While they enjoy looking at the trees and breathing in the clean, fresh air, they notice that some trees have messages tied to them. Lolli encourages listeners to select messages and read them; each message is a positive affirmation. When they walk further into the forest, they encounter the Thank You Tree, which has healing powers that can be accessed through expressing gratitude. Paige provides easy instructions for entering each meditation as well as leaving it. Elena Paige's second book in her Meditation Adventures for Kids, Lolli and the Thank You Tree, continues beautifully from her first introductory book. She guides her listeners to deeper meditation levels and, through the use of the messages on the trees encountered, shares a number of affirmations. She also provides easy antidotes to and insights on negativity and meanies, described in the story as Naughty Snooties. Paige's illustrations are lush watercolors filled with a combination of brilliant colors and pastel washes. Her approach is simple and elegant, and Lolli's instructions will make meditation a fun and eagerly anticipated part of a child's day. There's much in these guided meditations for listeners of any age, however, and I've personally gained insights from them for my own meditations. Lolli and the Thank You Tree, Meditation Adventures for Kids, Book 2 is most highly recommended. Lolli and the Thank You Tree by Elena Paige is a wonderfully illustrated book of empowerment. Book Two continues the adventure of discovery in which young readers will travel on the paths of their imaginations. Lolli continues the adventure of fun as young readers journey to a place of imagination as joy rains down. For those who have read Book One, Book Two will open the door to your imagination. The overall feel of the book is to instill confidence and self awareness. The author has created another wonderfully illustrated book. This creation entertains and educates. The fact that readers can be taught a valuable lesson while engaging joyfully is a beautiful combination. Throughout the book, the phrase "Thank you" is mentioned. When we are thankful for things, it allows life to take a course of joy. The book is written in such a way that children will actually feel a part of the story. I can see the delight on the faces of children as they take the journey with Lolli. The author's writing style is captivating and endearing. The book flows at a fun pace and allows readers to absorb the adventure in its fullness. You can feel the author's love for children exemplified throughout the book. Not everyone can write for children. It takes a certain mind set, gifted with compassion and humility to create books for children. This author stands among the selected few. I recommend this book to children everywhere. Lolli & The Talking Books by Elena Paige is the third book in the Meditation Adventures For Kids series. Lolli is back and is ready for more fun, creativity, and adventures! Start by visiting Lolli in the Land of Color. She has something special that she wants to give you. It is a present. It will help you go on another fun adventure, this time to see the Talking Books. You will be meeting new friends and learning new things. It is so exciting. Together with Lolli and a new friend, you will learn where stories come from and how to make your own. After you visit the talking books, you will go to see the Chocolate Tree. The Chocolate Tree is special. You will have a great adventure and help save chocolate. Then you will have a very exciting adventure in The Wind Maze. There you will learn how to make hard decisions and help some more new friends. Another wonderful book, full of great meditations and awesome ways to enhance creativity. With three unique stories, Lolli & The Talking Books by Elena Paige teaches the child reader the most important and fundamental meditation lessons. I am again impressed with the lessons within each of these colorful, well-constructed stories. Each short story teaches the child such things as a simple technique to help the child make decisions using color, or removing the child's worries by allowing bees to carry them away. By the time the child finishes these three stories, they will be equipped with the tools to handle stress, fear, and more. The Meditation Adventures For Kids books are a must-have for any child's shelf, especially the "intense" child. They can be used as a meditation, or read as a story. They are wonderful books to be shared with the family. Lolli and the Talking Books: Meditation Adventures for Kids, Book 3 is a collection of guided meditations written by Elena Paige. Building on the previous two books in her series, Paige's inspirational guide, Lolli, takes children on three new adventures designed to help them explore their creativity, have more confidence in making decisions, and learn to deal with new experiences that might seem threatening or scary. In the first meditation, Lolli and the Talking Books, Lolli brings aboard a friend from book 1, Liquorice the toucan, and she presents magical flying shoes to her listeners. These shoes fit differently than your typical shoe -- they fit around each toe, and they also sprout wings. It takes a bit of getting used to having flying shoes, but once that's accomplished, Lolli and her friends are off to the Land of Talking Books. Lolli shares the secret of how books come to be born and how the pictures we see in our imaginations can be turned into stories. 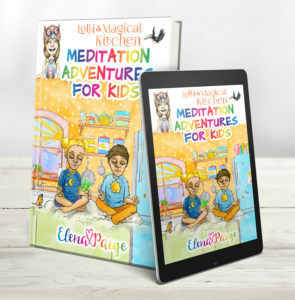 Elena Paige's collection of guided meditations, Lolli and the Talking Books: Meditation Adventures for Kids, Book 3, contain marvelous tools for unlocking the creative potential that rests within each of us. Paige's Lolli helps listeners learn to tune out the discordant and competing voices of the unborn books and focus upon a single one. Then she shows how an idea which might not, at first, be seen as original, can be turned into something unique and special. Her giant art carousel, where cherubs create marvelous illustrations for those books which have learned to sing, is an extraordinarily powerful image that particularly resonated with me. I'm so impressed with the depth and scope of these guided meditations. They are truly adventures, which build from their predecessors rather than repeating the same themes. Paige shows how strength, resilience, and creativity can be channeled and grow through meditation, and she does so brilliantly. Lolli and the Talking Books: Meditation Adventures for Kids, Book 3 is most highly recommended. The adventure with Lolli and a new friend, Liquorice, a toucan from the Land of Color, continues in Lolli and the Talking Books, a fun filled exploration of talking books, a chocolate tree, and a giant maze. Kids will be excited from the start. I like how the author, Elena Paige, introduces each chapter with a promising theme of excitement. In the first chapter, children are introduced to The Book Butterfly, the guardian and keeper of the talking books. In the next chapter, kids will be introduced to a tree made of chocolate fruit. This will excite young readers as their imaginations are explored. The last chapter is interactive, in which children will become a part of a giant maze. The way the author has created this story is engaging and fulfilling. I can't imagine a single child not enjoying the overall story. It takes a special author to be able to write such a story. I found myself smiling at the illustrations and the creativity exemplified. If I had children, I would definitely read these adventures to them. The adventures of Lolli form a wholesome collection of books that allow children to tap into their imaginations. One of the greatest gifts a child has is their imagination. It's pure and innocent. When we promote the participation of a child's mind, it allows them to grow away from fear. Children are our future and whenever an author writes a book geared toward children, this shows the character of the individual. Elena Paige is a very talented author, gifted with creativity and compassion for the youth. I would not only recommend this book to children, but also to pre-schools as a book to be included in their curriculum. Lolli and the Meditating Snail is a collection of guided meditations for children written by Elena Paige. These meditations can be read to children at bedtime or before a nap, or they can be shared as stories. Lolli always has something exciting planned whenever children ring her bell three times and call out her name. In this fourth collection of guided meditations, Lolli takes her friends to the Land of Purple where they get to meet Fred, a meditating snail, who was once a normal-sized snail but is now gigantic and purple. His growth and the purplish tinge that covers his world are due to his powerful meditation processes. And Fred will share his tricks for mind power with his guests, but only if they let him give them a very snail-slimy kiss. In Lolli and The Food Fight, Lolli shows her guests what she does with all the delicious food she makes in the Cooking Castle. Food fights are fun! Elena Paige's collection of guided meditations for kids, Lolli and the Meditating Snail, is filled with inspirational, educational and magical moments for kids and their parents or caregivers as their intrepid host, Lolli, takes them on three new adventures. The illustrations in this fourth book are lushly and brilliantly colored and fit the narrative perfectly. Again, Paige offers uncolored versions of her illustrations for kids to color in themselves. She includes body relaxation exercises in this set of adventures, as well as offering ways to overcome fear, shyness and insecurity. Paige's stories are marvelous and add a whole new allure to the process of meditation. I particularly enjoyed the Traveling Circus and the variety of animals and mythological creatures one encounters on this meditation. While I'm always eager and excited to see where Lolli is going to take us next, I'm finding that each of her adventures is well worth numerous repeated visits. Lolli and the Meditating Snail is most highly recommended. Lolli and the Meditating Snail: Meditation Adventures for Kids is the fourth book in the meditation series all about Lolli and the Land of Color by Elena Paige. Lolli is sure to be a hit with even the youngest of readers, with three different meditations that engage and entertain. Thanks to the first person point of view, you almost feel as though you're speaking directly with Lolli herself as she guides you on a wonderful adventure throughout the Land of Color. Her rich language and the beautiful illustrations allow children to simultaneously engage their imaginations and create a world of their own, as well as dive into the colorful landscape that has been provided for them. Filled with fanciful creatures like a giant purple snail, a color changing bullfrog, and singing sirens, Lolli and the Meditating Snail: Meditation Adventures for Kids is an enchanting book that is a must-have for the dreamers of dreams and anyone looking to stretch their imagination. The meditations can be read aloud with children, either to help them relax and fall asleep or just as a fun story for them to enjoy. With Lolli, children can feel as though they are taking part in the story, whether they are simply giving answers to her questions or helping her locate potion ingredients, bringing food to sick children, or passing out magical earmuffs. Along the way, children can also learn how to look at different situations in a more positive light, as well as navigate and deal with their emotions. Lolli and the Meditating Snail is the fourth installment in the Meditation Adventures For Kids Series written by Elena Paige. Through meditation, Lolli and Liquorice venture into the Land of Color. Their first adventure is in the Land of Purple where they meet Fred, the meditating snail, who teaches them how to have concentration and strong mind power. Collecting the ingredients together for this quest proves to be a riot. Their next adventure takes them to a special place called Cooking Castle that has a magical kitchen inside. With magical food from this kitchen, they go to a children's hospital to help them get well faster and later they organize a giant food fight. Finally, the duo gets to watch a traveling circus where they meet a number of fascinating characters. Elena Paige's Lolli and the Meditating Snail is just the perfect book to read to children between 4 and 10 years old at bedtime or at any time during the day. Little girl Lolli is naughty and nice and the toucan bird Liquorice is her partner in crime, I mean fun! The book also contains vivid and colorful illustrations that makes it exceedingly more interesting. Written in the first person narrative, Lolli tells her stories directly to listeners and this should make them feel that they themselves are practically going on an adventure with Lolli and Liquorice. At the same time, there are many lessons that can be learned along the way. Lolli and the Meditating Snail entertains as much as it educates so that children can face life with confidence and with lots of humor. Lolli and the Bunyip: Meditation Adventures for Kids is the fifth book in Elena Paige’s wonderful meditation series. This book and the series are all about Lolli and the Land of Color, as well as the different places you visit and the incredible creatures you meet along the way. Perfect for beginning readers to follow along or older readers to enjoy by themselves, Lolli offers three different meditations to help children relax and snuggle up in bed. The first person point of view ensures that children feel as though Lolli is speaking directly to them and helps make them feel more involved in the story. With beautiful illustrations and captivating meditation stories, Lolli and the Bunyip: Meditation Adventures for Kids is sure to be a hit in your household! Lolli and the Bunyip: Meditation Adventures for Kids is a perfect addition to Elena Paige’s meditation series. Beautiful stories with vivid imagery keep children engaged and entertained, while directions such as taking deep breaths, thinking about the people you love, singing, and letting your heart shine, allow children to slowly relax while they listen to Lolli as she takes them on an exciting adventure. Throughout the meditations, children help out some new friends, whether they are wallabies or even the stars in our sky, learning and growing as they do so. In addition, these meditation stories contain a mix of actual information and incredible imagination, thus ensuring that children remember that creativity and imagination are just as important as everything else! Lolli and the Bunyip : Meditation Adventures for Kids, book 5 is a children's adventure book written by Elena Paige. In each of Paige's Meditation Adventures books, Lolli takes children to her World, a place filled with far-away lands, fun animals and endless adventures. Each of the three stories in this book is a guided meditation and relaxation session. Children can read the stories along with their caregiver and look at the pictures before doing the meditation, or they can be encouraged to sit back, relax and visualize the stories. In Lolli and the Bunyip, Lolli takes her friends to Australia, to Uluru, in the Northern Territory. Uluru is also known as Ayers Rock, and it's large and red, like most of the surrounding countryside. Liquorice, the toucan, is already there, guarding the wallabies who are asleep. Lolli and her friends are going to join him in guarding them, which may seem a bit boring for an adventure, but marvelous ideas often come up when you're bored. Sometimes, it's okay to just accept that you're bored and see what happens next. In Lolli and the Lonely Star, Lolli takes her friends into outer space, wearing magical space suits and star goggles. Out there, they meet a lonely star who feels different and sad. This star likes to giggle and play, but none of the other stars wants to play with it. Lolli, her friends, and their new star friend travel through a black hole to find a galaxy where other stars like to giggle and play. In Lolli and the Treasure Map, the adventurers return to Lolli's Land of Color and try to help Bluebeard regain his stolen treasure. They follow a magical map and explore Grubbity Forest on their way. 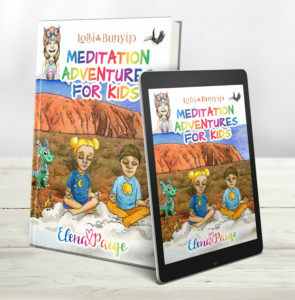 Elena Paige's children's metaphysical adventure book, Lolli and the Bunyip : Meditation Adventures for Kids, book 5, continues with this ground-breaking series that shows how infinitely adaptable meditation sessions can be, even for hyperactive, squirmy kids. I always seem to get a bit excited as I start following Lolli's breathing instructions, ring the bell three times and call her name. I've been a practitioner of meditation for many years, but have never seen the practice expanded in such exciting and adventurous ways. Each of Paige's meditations are free-flowing relaxation activities that also address social issues children may be wrestling with, such as feeling different, lonely or bored. In the meditations, children imagine themselves dressing in shorts and t-shirts for the desert or in spacesuits for a jaunt into outer space. Paige creates vivid, colourful guided meditations that will have many adults taking a second look at their same-old meditation practices and experimenting themselves a bit with Lolli's Land of Color and far-off adventures -- I know, I have. Lolli and the Bunyip : Meditation Adventures for Kids, book 5 will have kids feeling relaxed and quite pleased with life in general after they meditate with Lolli. This innovative book is most highly recommended. Lolli and the Bunyip by Elena Paige is another amazing book of adventures in the Lolli series. This time around, you will fight off wild cats in Australia with Liquorice, suit up in your astronaut gear for an adventure in space, and finally enjoy an adventure with Bluebeard the pirate. Imagine all the fun and excitement you will have along the way. You will get to team up with Liquorice in Australia to protect wallabies against the dangerous cats, with so many new and exciting discoveries about the area and its wildlife. Moreover, this is just the beginning of the fun in this 3-in-1 adventure. Lolli and the Bunyip by Elena Paige is another worthy addition to Lolli's adventures. The captivating tales will completely engage kids, draw them into Lolli's Land of Color, and make them feel like they are really part of the adventure. The meditation style of narration that starts each adventure is so much fun and both adults and kids (readers and listeners) will have lots of fun with it. The vivid illustrations make these already amazing adventures come alive even more, enabling kids to imagine it all and be part of it all. The stories are fresh, exciting and fun, and have lots of good lessons for young readers to take away. Lolli and the Bunyip is an amazing read for kids, anytime, anywhere, and they will read the adventures over and over. The Lolli series will make an amazing addition to a child's home or school library. Lolli and the Magical Kitchen: Meditation Adventures for Kids by Elena Paige is a delightful way to teach children how to find calmness through meditative techniques. In this book, Lolli and Liquorice talk directly to children, taking them on fun-filled adventures to the Land of Color. Children visit the Magical Kitchen, the Magical Garden and the Galapagos Islands. Each story begins with the same instructions to relax by closing their eyes, breathing and relaxing. Throughout each tale, more meditative instructions are given to enhance the calming experience. This book could be used by parents for bedtime reading, or it could become a conversation starter to help children cope with difficulties through meditative techniques. There are additional surprises in the stories. For example, in the Magical Kitchen story, children are taught good bedtime hygiene tips, with a few recipes for healthy evening snacks. The stories in this book are engaging and rich in meaning. The front cover, with two children in a meditative pose, is a great representation of what lies within. The artwork throughout the book, by Blue Monkey Studio, will entice children to join in the fun adventures. By using rainbow colors in numerous ways, the author helps children experience the wonderful effects of bright colors. Elena Paige has crafted a whimsical and enchanting book for children in Lolli and the Magical Kitchen: Meditation Adventures for Kids. This book is the sixth in a series, and it seems each one is comprised of wonderful journeys for children. These books are excellent for parents who desire a more holistic approach to life for their children. In this sixth book in a series of meditations for children, author Elena Paige uses soothing words and images to lull children into a safe space of peaceful fun. Lolli and Liquorice, fun-loving characters from the Land of Color, venture with your child to the magical kitchen where sumptuous desserts are made, and a lesson in making the most of our time rather than barricading our minds behind electronic gadgets. In Lolli and the Rose Garden, the child is directed to a magical flower garden where different colored roses encourage children to understand the human emotions of anger and frustration. In the final meditation, Lolli and the Blue-Footed Boobies, children are encouraged to appreciate the surroundings of home. With a combination of colorful illustrations and convincing narration, Lolli and the Magical Kitchen: Meditation Adventures for Kids is a delightful method of inducing relaxation in children. These stories can be used as just that, stories, or as a creative method of relaxation that normally is enjoyed by adults in this meditative bedtime story alternative. Paige’s soothing words and repetitive cadence effortlessly take the listener (and possibly the reader!) into a peaceful state of mind, encouraging the security of a safe and secure bedtime experience. Thus, I find this to be a delightful alternative way to encourage peaceful thoughts and healthy sleep. This is the sixth book in a series of meditations for children by Elena Paige that introduces a seldom-explored aspect of parenting. I anticipate these books will delight readers of all ages. Lolli and the Magical Kitchen: Meditation Adventures for Kids, Book 6 is a collection of story-based imaginative adventures written by Elena Paige. Lolli has three new adventures for her friends, and there are new friends to be made during each of them. Sharing these guided meditations is a perfect way to get kids to relax before naptime or bedtime. Parents can read them to their children while they're lying or sitting with their eyes closed, or they can have the children read along and enjoy the colorful and comical illustrations that accompany the tales. In the first adventure, Lolli takes her friends to the Land of Color for a visit to Lolli's Magical Kitchen in the Castle of Colors. It is a magical kitchen indeed, and getting there via a sloping and circling slide made of rainbow cake is just the start of a fun and educational adventure. Lolli teaches children about nutrition and the best ways to relax before bedtime during this adventure. She also shares recipes for slippery elm milk and a special banana and dark chocolate chip cake. In the second adventure, Lolli and her friends visit an enchanted rose garden. The roses there give special powers to those who sniff them. The yellow roses show you a mirror where you can see your grown up self, and the blue roses set the visitors off on a most exciting seafaring visit beneath the waves. The last adventure takes our friends to the Galapagos Islands, to visit with the Blue-Footed Boobies. 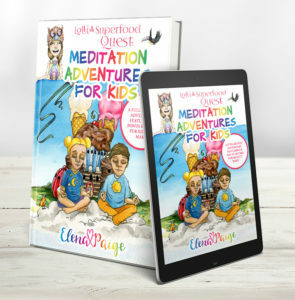 Elena Paige's story-based guided meditations, Lolli and the Magical Kitchen: Meditation Adventures for Kids, Book 6, continue to expand children's imaginative and creative powers while they help them cope with the stresses and strains that even little ones experience on a daily basis. I loved getting to see Lolli's kitchen, where everything has a name and appreciated how she helps children understand the best ways to relax before bedtime. I thought the Galapagos Island adventure was superb, especially with the gift of the shells that help children speak out about things that are troubling them. I'd have to say, however, that my favorite adventure, this time around, takes place in that magical garden of roses. This guided meditation gives children wings, a peek at their future selves, the ability to morph into their favorite animals and breathing apparatus to allow them to partake in an exciting mermaid rescue adventure. Along the way, Lolli teaches her guests how to deal with emotions in a positive way, without repressing them or being overwhelmed by them. I have a strong suspicion that quite a few parents and caregivers will find themselves venturing into the garden of roses on a sleepless night as well - it's just too tempting a prospect for anyone to resist for long. Lolli and the Magical Kitchen: Meditation Adventures for Kids, Book 6 continues to explore the magic that can be found in guided meditation; it's most highly recommended. Have you met Lolli and her toucan friend, Liquorice? Lolli and The Superfood Quest by Elena Paige is a children's meditation book. Lolli and Liquorice live in a very special place. They have many adventures. They would love for you to help them on their newest quest. Someone has destroyed a magical castle, and they need you to help them on their search to find some special ingredients called superfoods to help fix the castle. Do you know what a superfood is? Do you think that you would like to help them? It may mean traveling to many unique places like China and Iraq, but don't worry, Lolli and Liquorice will show you how. They will even send you home with some of Lolli's favorite superfood recipes to try with your family. Are you ready to go on a fun and colorful adventure and meet new friends? Lolli and The Superfood Quest (Meditation Adventures For Kids Book 7) by Elena Paige is another exciting adventure story that helps children learn the importance of superfoods, where some of them come from, and how to use them. I appreciated how the superfoods are introduced and the child is gently led to learning more about them as the story progresses. At the end of the book, the author has kindly included some raw, vegan, dairy-free, nut-free, and egg-free recipes that are very delicious. I love Elena Paige's Meditation Adventure books! They are a unique and easy way to help relax a child by disconnecting them from ego and reconnecting them with love. Each book is created to help children address low self-esteem and stress through the creative use of a story-like guided meditation. I have used her meditations on my autistic son, as well as myself, and they have worked wonders for us both! This is an extraordinary book for families and will delight children from the age of three and up. I Love Being Free: Lolli's Happy Heart Rhymes Book 1 by Elena Paige is an entertaining picture book with beautiful rhymes and illustrations that introduce two lovable characters, Lolli and Liquorice from the Land of Color, who teach readers about life and living. The 14 poems in the book revolve around topics like having energy, magic, drawing, saying sorry, feeling happy, being different, being creative, and much more. Through the rhymes, the author explores the issues connected to life, values, telling the truth, having adventures, and growing up, and teaches kids to be themselves and have a lot of fun. The rhymes are fun and interesting and the author makes these more fascinating and appealing to readers with the help of colorful illustrations. The illustrations make the concept and the author's words vivid and clear and help children connect well with the author's thoughts. It's a good bedtime storybook for children and parents and grandparents can read it out to their kids and grandkids. The rhymes can also be used for read aloud sessions in classrooms and school libraries to impart good values to children. Children understand the concepts, thoughts, and the messages in books more easily when conveyed with the help of rhymes and illustrations. This book of rhymes will definitely encourage kids to be creative, imaginative, and more resilient, and also to have fun while solving the problems in their lives. I Love Being Different is the second book in the Lolli's Happy Heart Rhymes series, written in rhyme by Elena Paige and illustrated by Josef Hill. Each of the book's poems comprises eight lines, presented by Lolli and Licorice from the Land of Color. The fun-filled poems outline different things children enjoy doing and why. Examples of things which children enjoy are: having energy, crying, magic, teddy, being creative, sharing, thunder, drawing, feeling happy, drawing and more. With full-color illustrations accompanying each poem, the words are brought to life so beautifully, encouraging children to seek out the positive aspect of all things amidst the negatives in life with each turn of the page. Whilst some of the poem titles in the book may appear to project negativity in some way, when you actually read through the poem, you will see that it turns most of the negatives into positives, which is something all children can hopefully achieve in their lives. I believe that all children should be able to enjoy books at a very young age, as it builds on their language skills and helps with their confidence, character and emotional development. I enjoyed all of the positive poems and delightful illustrations throughout the book, and recommend that this book, designed for children aged between 4-8 years, be stocked in home, school, kindergarten and hospital libraries. I Love Trying New Things: Lolli's Happy Heart Rhymes Book 3 by Elena Paige is a delightful book of rhymes that revolves around the characters of Lolli and Liquorice from the Land of Color. Lolli inspires children to be more creative and imaginative, and she shares with them what she loves the most. All the poems in the book are encouraging and uplifting and they inspire kids to find happiness, deeper meaning, and solve life's problems. The author's words will also guide children to make their lives more positive. The fun-filled rhymes are entertaining and the beautiful illustrations that go with each poem bring out the concepts clearly, helping kids to connect with the words. It's a good bedtime storybook and can also be used for interactive sessions in classrooms and school libraries. It's a good way of teaching kids to look for positive things amid all the negativity surrounding them. The book not only teaches kids to be positive, but also helps to build their confidence, character, and language development. The different things children enjoy like sharing, feeling happy, and other emotions are relatable to readers. Children can understand concepts, messages, and thoughts easily when narrated with the help of stories, rhymes, and illustrations. This book is a must-have in one's personal collection as it will encourage kids to look at the good things in life and also turn negatives into positives.